Altapure’s process and delivery technology is agent independent, and can deploy many different types of liquid agents in sub-micron aerosol form, depending on the situation and needed results. Altacare ® cold sterilant is a powerful broad spectrum disinfectant, that is a clear aqueous solution consisting of Peracetic Acid (Peroxyacetic Acid). This product contains only pharmaceutical quality raw ingredients. This choice of quality ingredients curtails the introduction of undesirable materials into treated areas like pharmaceutical processing sites and clean rooms. Altacare ® PAA chemistry has been utilized in hospitals and clinics for over 20 years. In addition, it is registered for use in locations such as but not limited to: industrial laboratories, hospitals, medical product manufacturers, pharmaceutical manufacturers, bio-tech companies, and food & beverage processing plants. The Altacare ® cold sterilant is also fully biodegradable and environmentally friendly, and it decomposes and dries into safe and environmentally friendly components of: water vapor, oxygen, and acetic acid (vinegar) vapors. The result is residue-free treated surfaces. 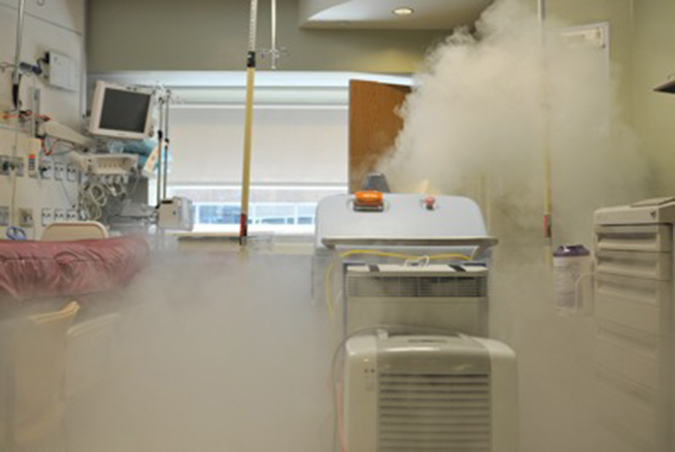 The Altapure process can be safely used in many different industries, including all health care environments. Altapure has been used for years without any problems in hospitals throughout the United States. For example, during clinical trials at Methodist Hospital, and after more than 1,300 treatments in hospital areas including ICU units, Patient Rooms, Dialysis Facilities, and Operating Rooms, no damage to equipment or employee issues were observed. As you can see the deployed liquid is dilute, and when combined with the deployed sub-micron aerosol fog, a quick aerosol contact time with the treated surfaces (due to our process’s D-Value of 2.3 – 2.6), the result is a combination of attributes that allows for high material compatibility that is gentle on treated equipment. Dilute yet effective solution with only 0.18% PAA and 0.88% H2O2. "Extremely thin film” deposition due to the very small sub-micron aerosol size. Short aerosol contact time needed for spore kill (see D-Value data) & full efficacy (see Efficacy data). Rapid dehumidification times with Altapure’s Air Reprocessor system. “Closed Loop Aerosol Control” system limits over-treatment of room surfaces. Altacare ® is EPA approved for fogging as a part of regular cleaning and disinfecting procedures for hard room surfaces. To learn more about the cold sterilant Altacare ®, please click here.